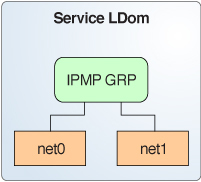 On an Oracle Solaris 11 system, you can configure IPMP in a service domain by configuring physical interfaces into a group in the same way as on a system that has no virtual network or domains. On an Oracle Solaris 10 system, you can configure IPMP in the service domain by configuring virtual switch interfaces into a group. Figure 21 and Figure 22 show two virtual switch instances (vsw0 and vsw1) that are bound to two different physical devices. 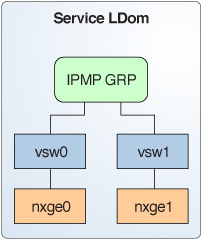 The two virtual switch interfaces can then be created and configured into an IPMP group. In the event of a physical link failure, the virtual switch device that is bound to that physical device detects the link failure. Then, the virtual switch device sends notification of this link event to the IP layer in the service domain, which results in a failover to the other virtual switch device in the IPMP group. The two physical interfaces are net0 and net1 in Oracle Solaris 11 and nxge0 and nxge1 in Oracle Solaris 10.